Let's take a trip back in time to the day that I found out what I am allergic to. Just like your average elementary school kid, I ate my bowl of Mini-Wheats everyday around 8 o'clock when Curious George cam on before school. I had enjoyed eating my favorite cereal with milk for years upon years up until middle school. I noticed that I had an influx of new stomach aches and problems that I had never felt before. As you can imagine this included multiple trips to the bathroom and me holding my stomach and bending over hoping staying in a certain position would alleviate the pain. My parents always tried to help me not think about the pain but as it continued over multiple months and continued to get more painful, my parents took me in to see an allergist. At the time I wouldn't have known how much help he would be but Dr. Travis Miller would end up help diagnose my problems when other doctors would not. He works in Folsom and Roseville for the Allergy Station if anyone wants to get help from a fantastic doctor. Anyways, when I was 14 he decided to give me an allergy test to see what foods, medications, or environmental factors I might be allergic to. I got my skin pricked and scratched by about 30 needles with small amounts of a bunch of different common allergens. After waiting close to 15 minutes, he and a nurse came back in to see what allergens made my skin react the most at its surface. I found out that I am allergic to all types of trees, grasses, weeds, dust, dust mite, mold, gluten, wheat, dairy, rye, barley, and oats. As you can imagine it devastated me. I began my gluten free/dairy free diet and if you have experienced it you know that the food does not taste as good. Over time I've gotten used to it and I think it tastes really good. I was glad to see how supportive my parents were because they continually cooked and ate at places that had gluten free options despite me being the only kid with a food allergy in the family. I really appreciated all my mom did for me through this time being there emotionally and learning how to cook the best gluten free food at home. On top of the new diet I had to adjust to, I also began allergy shots. 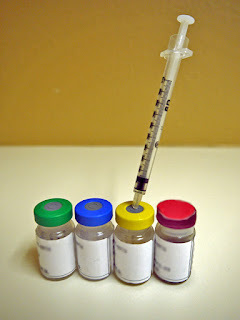 They have helped me a lot over the years despite being a pain to go to, especially how often you need to receive shots in the beginning of treatment. As for my allergies to grass, weeds, trees, dust, and mold, I just rely on Allegra to help my body cope with the allergens. It hasn't stopped me from going out and playing in the outdoors with friends and family so I'm glad it hasn't affected me to that extent. Having allergies hasn't necessarily made life any easier, especially having to always get food from places that offer options, but it also makes it fun to find new places that I normally wouldn't ever go to.